When Premier Xi rubbished the 12 July 2016 verdict of the International Permanent Court of Arbitration at The Hague on China’s claims over most of the South China Sea, what exactly was meant? For no international justice system had thus far ever called China to order for its expansionist strategy. What the Hague had in fact done was not only to uphold the case filed by the Philippines in 2013, after China seized a reef in the Scarborough Shoal; but also condemned China’s conduct in the South China Sea over construction of artificial islands and setting up military infrastructure. In an unequivocal rebuke, it found China’s expansive claim to sovereignty over the waters had no legal basis, historical or otherwise. The verdict gives motivation to the governments of Brunei, Indonesia, Malaysia, Vietnam and Taiwan to pursue their maritime disputes with Beijing in the Permanent Court of Arbitration (PCA). Small wonder then is Premier Xi’s fulmination. The central issue before the PCA was the legality of China’s claim to waters within a, so called, “nine-dash line” that appears on official Chinese charts. It encircles 90 per cent of the South China Sea, an area of 1.9 million square kilometres approximately equal to the combined areas of Afghanistan, Pakistan and Myanmar put together. Philippines contention was that China’s claims were in violation of the United Nations Convention on the Law of the Sea (UNCLOS), which both China and the Philippines have ratified. In its decision, the tribunal said any historic rights to the sea that China claimed “were extinguished” by the treaty. And its failure to be a party to the deliberations in no way bars the proceedings. The UNCLOS lays out rules for drawing zones of control over the world’s oceans and seas based on coastal orientation. While the concept of Historic Waters means waters which are treated as internal waters where there is no right of innocent passage. As far as the “nine-dash line” (originally eleven-dash) is concerned; following the surrender of Japan in 1945, China produced a proprietorship chart titled “Position of the South China Sea Islands” that showed an eleven-dash line around the islands. This map was published by the Republic of China government in February 1948. It did not hold onto this position after it fled to Taiwan. The Chinese Communist Party, however persisted with this cartographic notion, modifying the 11 to 9 dashes when in 1957, China ceded Bailongwei Island in the Gulf of Tonkin to North Vietnam. The PCA concluded that China had never exercised exclusive authority over the waters and that several disputed rocks and reefs in the South China Sea were too small for China to claim control of economic activities in the waters around them. As a result, it found, China outside the law in as much as activities in Philippine waters are concerned. The tribunal cited China’s construction of artificial islands on the Mischief Reef and the Spratly archipelago as illegal in addition to the military facilities thereon which were all in Philippine waters. The episode has besmirched the image of Xi Jinping, his politburo and indeed the credibility of the Communist Party of China (CPC). Tolose their legal case for sovereignty over waters that they have heavily invested in must come as a rude shock to their global aspirations. A complaisant response may set into motion the unravelling of the CPC’s internal hold on the state as defence of maritime claims is central to the Communist Party’s narrative. Any challenge to this account is seen in Beijing as a challenge to the Party’s rule. But the die has been cast; it remains to be seen how more regions and neighbours respond to China’s unlawful claims wherever it is perceived to exist. An indication of the regional response was Vietnam’s immediate endorsement of the tribunal’s decision. Thus far China has responded sardonically with a typical Cold War propagandist style avowal “We do not claim an inch of land that does not belong to us, but we won’t give up any patch that is ours. The activities of the Chinese people in the South China Sea date back to over 2,000 years ago.” said the front-page in The People’s Daily, which ridiculed the tribunal as a “lackey of some outside forces” that would be remembered as a “laughingstock in human history.” Such dippy doublespeak has no place in contemporary geopolitics. For China to do nothing about the matter will be difficult in the extreme. It does not take a political pundit to note that some form of immediate coercive military manoeuvre in the South China Sea is in the offing. Also, it would hardly be realistic to expect China to scurry away to dismantle the military infrastructure it has so far set up; more likely it is their revisionist policies that would be reviewed. Towards the end of the Cultural Revolution, in 1976, China brought out a movie titled “Great Wall in the South China Sea,” it was not about the inward looking narrative of Chinese civilization but of “expansive conquests that would knit together all of South East Asia.” The Hague’s verdict has grievously injured the latter strategy. And if the free world is to rein in China’s bid to rewrite the rule books including the right to unimpeded passage in the South China Sea then, it would do well to convince her of the illegitimacy of her position. In the meantime Indian diplomacy should promote the littorals of the South China Sea to seek arbitration for their maritime disputes with China at The Hague. The mystery of the missing Malaysian Airlines MH 370, code sharing with China Southern Airlines CZ 748, bound from Kuala Lumpur to Beijing, continues to confound and baffle in the fundamentals of the episode. Was it a sudden and nameless catastrophic end to an ill fated flight or was it a failure of surveillance that led to a controlled and purposeful disappearance of a marked commercial carrier? 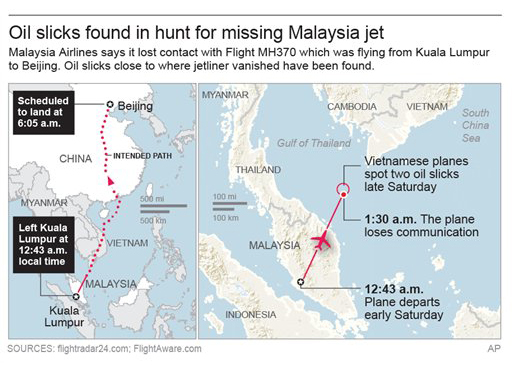 Look at the facts; the last reported position of the aircraft was on 08 March 2014 at 01:19 hours (local time Malaysia) in the Gulf of Thailand at its first navigational way point IGARI, about 500 kilometres (kms) north east of Kuala Lumpur at an altitude of 35,000 feet cruising at 872 km/h well on its predetermined route to Beijing. This account was immediately followed by loss of all communications and a possible disabling of the secondary radar (transponder). MH 370 was now less than 200 kilometres from the Vietnamese coast with orders to call up Ho Chi Min city Air Traffic Control (ATC). Normal procedures demand a positive overlap when control passes from one ATC to another; this would appear not to have occurred which in itself ought to have rung some alarm bells particularly in a dense airspace which accounts for nearly 16% of global traffic (see Map 1; authors research suggests that there were at least 25 aircrafts on international transit within 500 kms of MH 370 at that instant). Leaving aside the initial bungling by Malaysian aviation authorities; conspiracy theories abound, from a terrorist attack to a suicidal cockpit to a US sponsored clandestine seizure and strike to prevent high security cargo from falling into Chinese hands. However, more significant to our narrative is the response of China’s most recent Flight Information Region (FIR) Centre at Sanya and its integration into that nation’s Air Defence network. The Sanya FIR (in Hainan) is responsible for managing traffic and maintaining continuous surveillance over the South China Sea. Its formal area of responsibility is a sea space of 280,000 square kilometres which approximates a square of 530 kms sides or a circle of diameter 600 kms extending into the South China Sea. 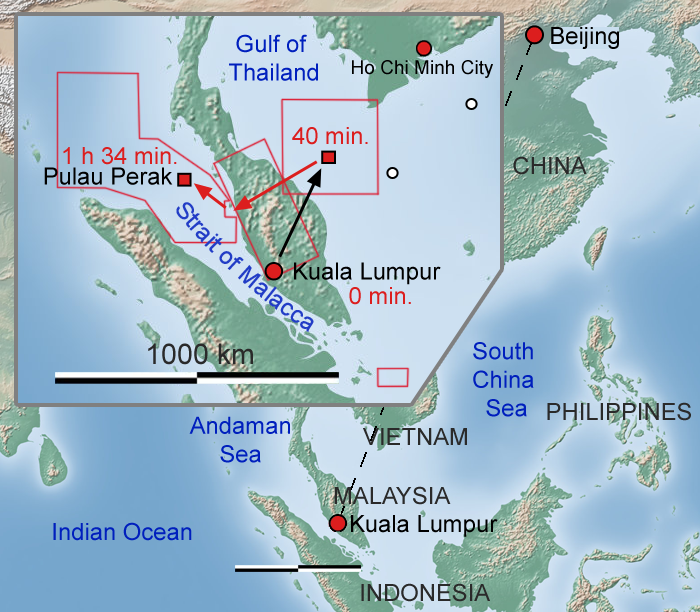 While China’s claim to sovereignty over the entire South China Sea does not include the Gulf of Thailand; the last reported position of MH 370 was within 500 kms of its claimed territorial sea and about 1200 kms from Hainan. Also, had the flight stuck to its planned route, it would have over flown Vietnam and entered Chinese “airspace” in the Sanya FIR by 0215 hrs; it did not and therefore the question arises why was Sanya Air Control Centre at such a run down state of alert and the Chinese Air Defense organisation wanting in alacrity or in a heightened state of readiness? Given the current imbroglio in the South China Sea, the state of air surveillance it may be assumed, would have demanded early tracking and far more credible situational awareness. And a consideration that cannot be lost sight of is the fact that Hainan is home to the Chinese South Sea Naval Fleet at Beihai and houses its strategic ballistic missile submarine force at Yulin; which must play some part in assuring domain wakefulness. At 0215 hrs comes a positive pick up of MH 370 by Malaysian military radar fixing the aircraft 320 kms North West of Penang at 12000 feet altitude on a westerly heading; having deviated 500 kilometres west of its intended track (see Map 2). This information had to have been passed to Sanya FIR since the aircraft was bound for Beijing. Two possibilities emerge; both the entire air space management organisation and air defence network in China were in deep slumber or our own appreciation of China’s Air Defence Surveillance is flawed. They just do not seem to have the essential surveillance capability, after all an overdue aircraft whether overdue at destination or any of its waypoints is no trifling matter from both the safety and security perspective. China today is transiting through the three accepted strategic phases of great power status; from volume trade through resource grabbing economic expansion to a security dominated and status-quo challenging entity. Admittedly, this principle is simplistic in form and motivation. Yet it captures the essence of how nations in their quest to make possible enhanced economic development through means that have a unidimensional focus have generated anxieties in the environment. This air of disquiet amongst states in turn morphs into fear and suspicion. Contemporary China fits well into this mould. To the astute military analyst the 370 incident places the edifice of China’s Anti Access Area Denial (A2AD) Strategy, upon which is predicated the emergence of the People’s Liberation Army as a major player in the Asia Pacific region, as some what less than persuasive. The strategy is based on the marriage of the Dong-Feng 21D anti surface ballistic missile as the “aircraft carrier killer” with matching surveillance capability that could detect and target hostile aircraft carriers at ranges in excess of 2000 kilometres. Critically the kill chain begins with detection of the Carrier’s flight operations. The entire episode must also have come as a dampener to the heady mixture of Chinese nationalism, its new found wealth and its urge to upset the status-quo that animates what may be called the ‘China Arrival’. If China touts the A2AD strategy as its existential future, it is clear that the credibility of such a scheme has taken a hammering. In defence, China’s planners may argue that they had not brought to bear the full weight of their military surveillance capability for security reasons; but this contention does not hold very much water for two reasons; firstly by 09 March Chinese remote sensing satellites had been deployed with considerable operational alacrity (if not precision) to join the search effort and secondly the A2AD strategy is, to all intents and purpose, a deterrent strategy and under the circumstance conditions were ideal to demonstrate its surveillance competence. In the event its satellite reported possible debris of the ill-fated aircraft within 90 kms south of Vietnam’s Tho Chu Island about 150 kms north of the last known position reported at 0130 hrs on 08 March. The search centre moved to this new position; however the deployed scouts drew a blank. The fresh datum for the search served to dilute international exertions which only regrouped after an analysis of satellite communications doppler shift to concentrate efforts 9 days later in the south Indian Ocean about 6000 kms. southwest of the of the first report. The search for the remains of the hapless MH370 continues. Meanwhile China’s quest for an existential strategy as a prelude to confronting the status-quo is convincing nobody.